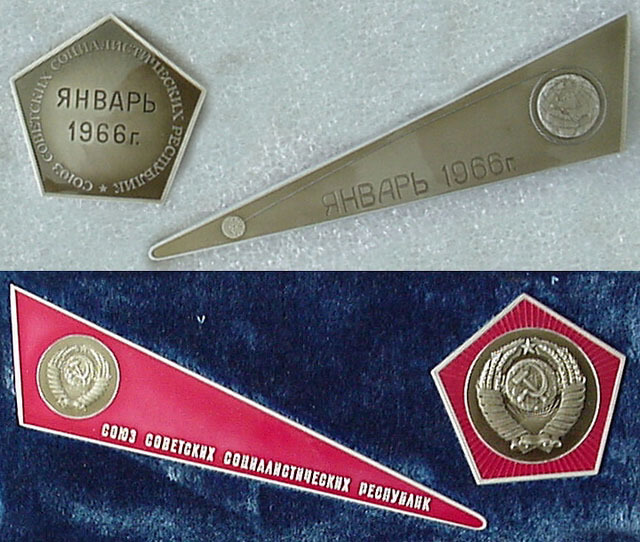 Soviet lunar and planetary probes carried metallic pennants to be deposited on other planets. These were highly durable, titanium with thermoresistant polysiloxane enamels, capable of surviving intact even on the surface of Venus. Artistically interesting, they can provide clues to the identity of spacecraft in photographs or even the purpose of unpublicized missions. A few dozen of each type are minted, to be installed on spacecraft and handed out to a few VIPs and top scientists. It should be noted that in 1967, the Soviet Union was among the signers of the Outer Space Treaty, which forbids the claiming of any celestial body as territory. Thus the landing of pennants should not be misinterpreted as such. In 1959, Luna-1 was the first spacecraft to achieve escape velocity. It was probably intended to impact the Moon, but it missed and went into a heliocentric orbit. It also carried a ball of pennants as Luna-2 did. The messages are Ianvar' 1959 (January 1959), SSSR, Soyuz Sovetskikh Sotsialisticheskikh Respublik (Union of Soviet Socialist Republics). The first spacecraft to impact the Moon, in 1959. It carried two spheres (7.5 and 12 cm in diameter) filled with liquid and an explosive charge, designed to burst apart on impact and scatter pentagonal pennants. The messages are Sentiabr' 1959 (September 1959), SSSR, Soyuz Sovetskikh Sotsialisticheskikh Respublik (Union of Soviet Socialist Republics). The icon of the wreath of grain around the hammer and sickle is the state seal of the USSR. Luna-2 and its pennants were actually probably vaporized. They struck the Moon at a relative velocity of 3.3 kilometers per second. Assuming kinetic energy is converted to heat, and given the specific heat of steel, the resulting temperature obtained is 11000° K.
It is not known if Luna-3 carried a pennant. The first spacecraft to land on the Moon. It transmitted 360º panoramic images of the surface. 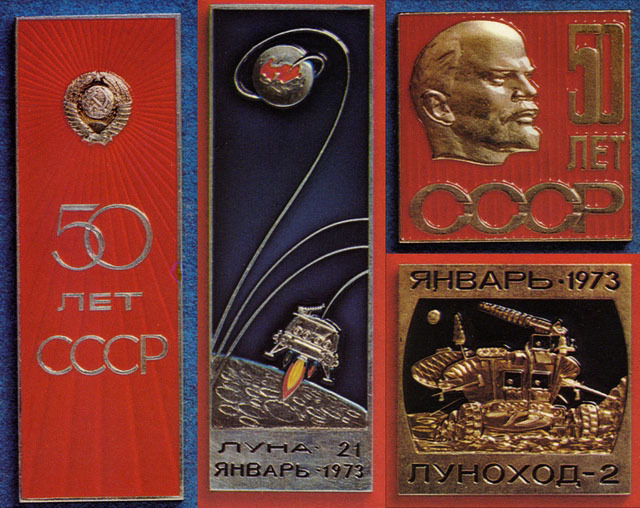 The messages include Ianvar' 1966 (January 1966), Soyuz Sovetskikh Sotsialisticheskikh Respublik (USSR) and the state seal. The Luna-13 lander may have carried similar of pennants, as probably did the failed landers Luna-4 to Luna-8. The first spacecraft to orbit the Moon. It returned gamma-ray spectra of lunar rock. 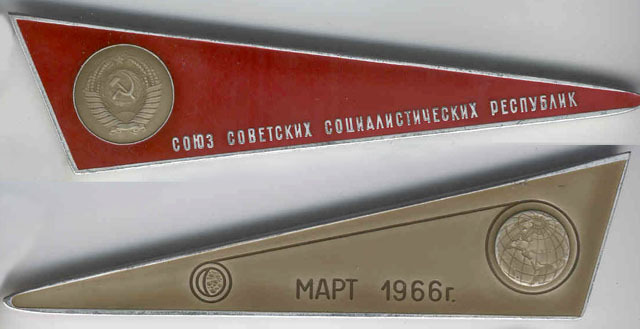 The messages include Mart 1966 (March 1966), Soyuz Sovetskikh Sotsialisticheskikh Respublik (USSR) and the state seal. Luna-12 photographed the Moon using the same type of camera as Zond-3. 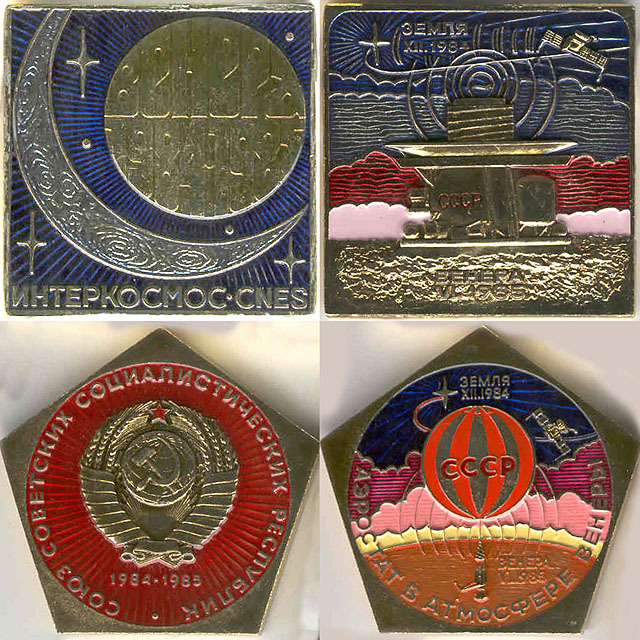 The messages include Luna-12 Oktiabr' 1966 (October 1966),Luna-11 Avgust 1966 (August 1966) Soyuz Sovetskikh Sotsialisticheskikh Respublik (USSR) and the state seal. A Luna-11 pennant is the same style as Luna-12, indicating it was probably a failed photo mission of the same design, not a Luna-10 style orbiter as sometimes reported. The first robotic moon-rock-retrieval missions. The messages are Luna-16, Sentiabr'. 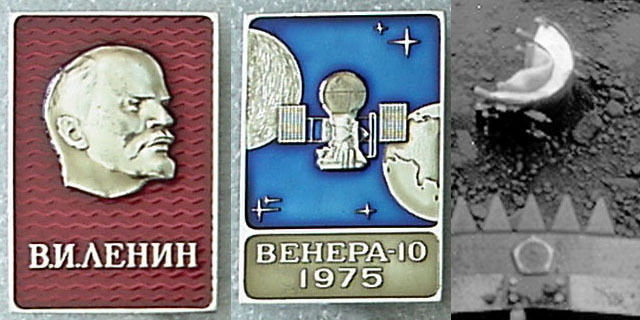 1970, Zemlia, Luna, Zemlia (Moon-16, September 1970, Earth, Moon, Earth), SSSR, Soyuz Sovetskikh Sotsialisticheskikh Respublik (USSR) and the state seal. Luna-20 performed a similar mission and carried the same type of pennants, with the date Febral' 1972 (February 1972). Luna-15 probably had similar pennants. If it had not crashed, it would have returned moon rocks before Apollo 11. The Lunokhod moon-rover missions. Lunokhods were large solar-powered robots that spent several months driving around the Moon, returning images and doing mineral analysis. 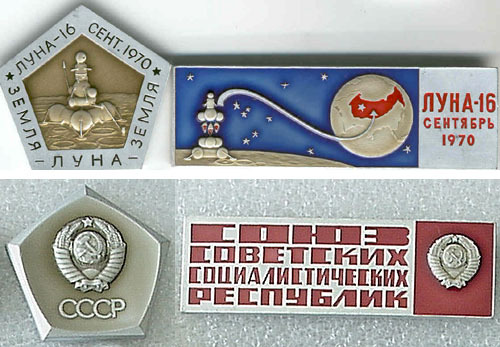 The messages are Luna-17, Noiabr' 1970 (Moon-17, November 1970) and Soyuz Sovetskikh Sotsialisticheskikh Respublik (USSR) and the state seal. Luna-21 carried Lunokhod-2. It's messages are Ianvar' 1973, Lunokhod-2, SSSR, 50 Get. (January 1973, USSR, 50 years - anniversary of Lenin's death). A more advanced robotic sample-return mission. Luna-24 drilled 1.6 meters into the moon and returned the core sample. The messages are Luna-24, Avgust. 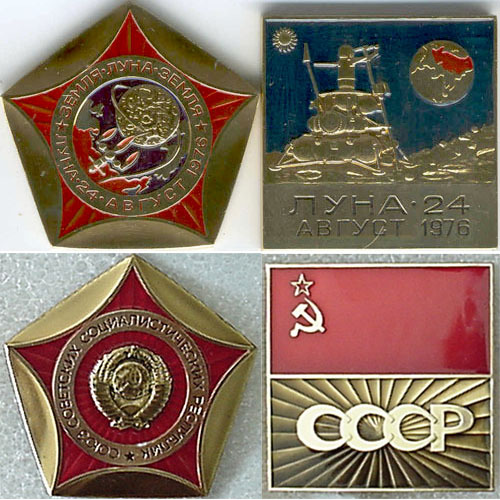 1976, Zemlia, Luna, Zemlia (Moon-24, August 1976, Earth, Moon, Earth), SSSR, Soyuz Sovetskikh Sotsialisticheskikh Respublik (USSR), the state seal and Soviet flag. Luna-23 probably had similar pennants, it performed experiments but its drill and return module were damaged. No pennants are known for heavy orbiters, Luna-19 and Luna-22. Mars-3 was the first spacecraft to land on the red planet. Its sister ship Mars-2 crashed, but both orbiter sections sent pictures and data for 8 months. The messages are Mars-3 1971, Mars-Zemlia, Zemlia Venera Mars (Mars-3 1971, Mars-Earth, Earth Venus Mars), SSSR, Soyuz Sovetskikh Sotsialisticheskikh Respublik (USSR) and the state seal. Each ship had both types of pennants shown above. Presumably penannts were included in the 1973 Mars-6 and Mars-7 landers. It is not known if pennants were contained in the 1962 mission attempt. A sister ship of Mars-1, carrying a descent capsule, was stranded in Earth orbit. The first interplanetary probe, Venera-1's orientation system overheated and failed. Venera-1's sister ship was stranded in orbit, and after it reentered the atmosphere, its pennant was discovered by a boy in Siberia. The first Soviet Venus probes contained a round pennant inside a metallic globe of the earth, with blue tinted oceans and gold tinted continents. The message is Zemlia Venera 1961 and SSSR, Soyuz Sovetskikh Sotsialisticheskikh Respublik (USSR), the other side had the state seal. 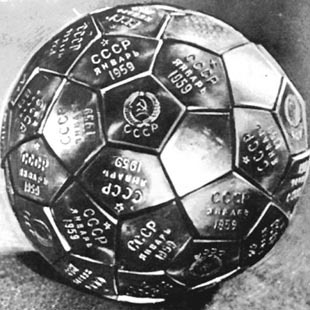 The globe and medallion were enclosed within a protective shell of stainless steel pentagonal elements, similar to the Luna-2 ball of medals. 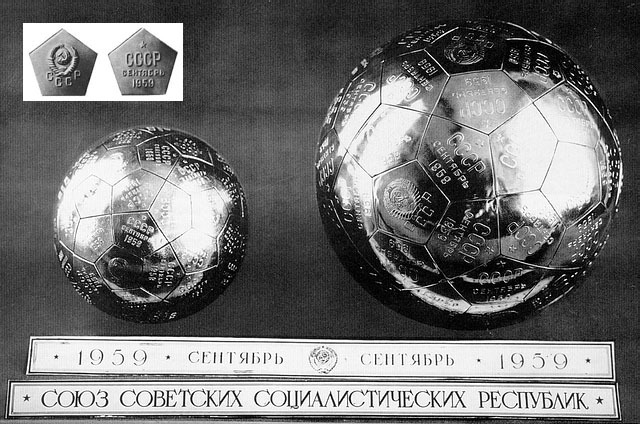 Each pentalgonal element was inscribed with "Earth Venus 1961". Venera-3 was the first spacecraft to impact another planet, Venus. Note the different configuration of planets in 1961 and 1965. The message is Zemlia Venera 1965 and SSSR, Soyuz Sovetskikh Sotsialisticheskikh Respublik (USSR), the other side had the state seal. Similar pennants were contained on the 1962 2MV missions, lost in launch mishaps, and on the 1964 Zond-1 mission to Venus. The first probe to transmit data from Venus (or any planet). Venera-4 was designed to withstand 10 atmospheres pressure and was crushed at an altitude of 26 km. 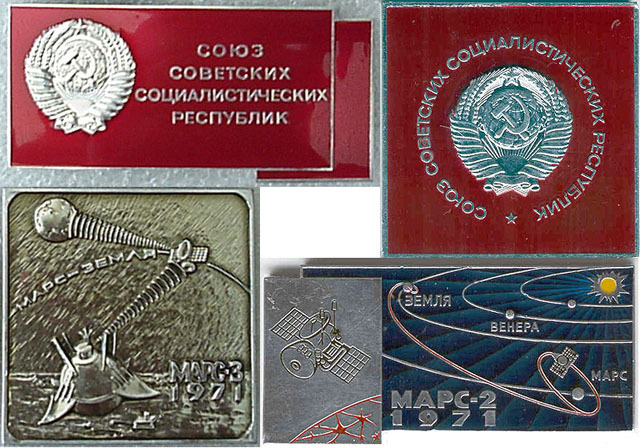 The messages are Iyune 1967, Zemlya, Venera (June 1967, Earth, Venus) and SSSR, Soyuz Sovetskikh Sotsialisticheskikh Respublik (USSR) and the state seal. The Soviet Encyclopedia indicates Venera-4 also contained a flag-shaped pennant, red on front and blue on back. Sister ships, Venera-5 and -6 were strengthened to withstand 25 atmospheres, and were crushed at 19 km. Venera-7 was the first spacecraft to land on Venus. Venera-8 returns illumination information from the day side of Venus. All four probes had identical pentagonal pennants, and almost identical square pennants. Backs differed in the dates and spacecraft names. Venera-6(5), Zemlya Yanv 69, Venera Mai 69 (Earth January 1969, Venus May 1969). Venera-7, Zemlya Avg. 70, Venera Dek. 70(Earth August 1970, Venus December 1970). Venera-8, Zemlya Mart 72, Venera Iyune 72 (Earth March 1972, Venus June 1972). The front sides differed slightly in design. Venera-5 and -6 had a border around Lenin's face reading Soyuz Sovetskikh Sotsialisticheskikh Respublik (USSR). Venera-7 and -8 were borderless, but Venera-7 has the additional text 100 GET (100 years -- anniversary of Lenin's birth). Venus heavy landers with cameras and soil analyzers. These missions carried identical pennants, except for years and names. Venera-9(10) 1975, Venera-11(12) 1978, Venera-13(14) 1981. The pentagonal pennant can be seen above, fastened to the landing ring of Venera-13 on the surface of Venus. Identical missions Venera-15 and 16 performed synthetic aperture radar mapping of the north polar region of Venus, as well as other experiments. Messages are Zemlia 1983, Venera-16, SSSR (Earth 1983, Venus-16, USSR). Complex missions including landers on Venus, balloon-born instruments in the Venusian clouds, and photography of Halley's comet. The messages are Zemlia XII 1984, Venera VI 1985, Aerostat b Atmosphere Venery, Venera 1984 1985 Interkosmos CNES (Earth December 1984, Venus June 1985, Balloon in Atmosphere of Venus, Venus 1984/1985 Intercosmos CNES) and SSSR, Soyuz Sovetskikh Sotsialisticheskikh Respublik (USSR) and the state seal. Intercosmos/CNES was the Russian/European join council that planned the mission. 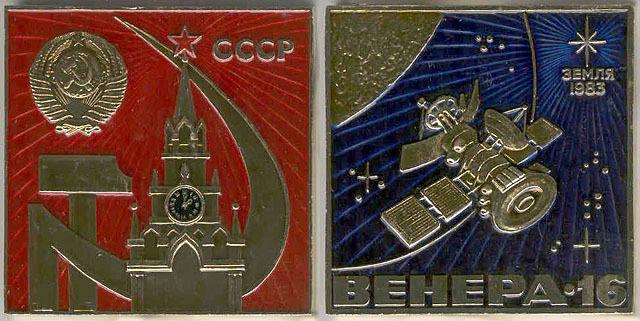 Many of the pennant images are courtesy of Alex Panchenko Collectables. The photo of the Luna-1 pennant is courtesy of Vladimir G. Kurt.